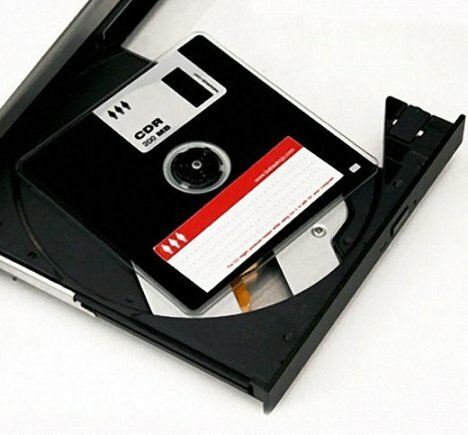 CD-R Fashioned To Look Like Obsolete Floppy Disk | OhGizmo! The floppy disk has been dead for years now. I still remember working in retail and having to explain to customers why their new computer wouldn’t include a floppy drive. I believe the last time I had to use one was when I installed XP on a SATA drive. If you miss the sight of those ugly black disks, you could always get these Floppy CD-R discs. What’s interesting here is that someone has decided to take a dying format and disguise it as a dead piece of technology. I’m not necessarily implying that we’re going to stop seeing CD’s in the near future, but I can count the number of times I’ve burned a CD in the last year on one hand. I usually just copy files onto a flash drive, or email the file if it’s small enough. With their relatively small (200MB) size and $10 per disc price tag, they aren’t good for much more than nostalgia.